A first foray into documentary film-making? I think not. 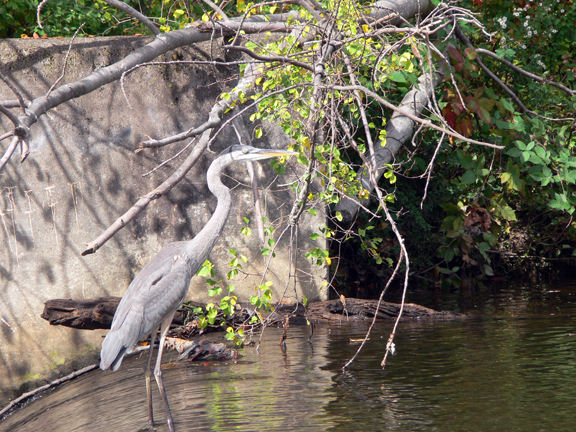 But anyway,here is our "Heron in Residence" having a late lunch.Warning! it is Nature in action. That's Alex in the background working on his Marlin Perkins. A Big Thank You! to all those who came out, bright-eyed and bushy tailed, to the Paint and Play event !!! 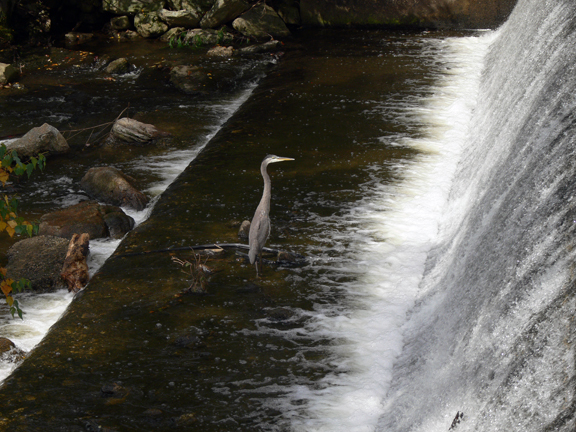 Artist Edna Wells discovered that our “heron in residence” had a secret fishing spot by the dam. ”Henry” as we call him, was quite cooperative this morning in entertaining our guests. He kept artist Pat Piscapo, from Phoenix Rising Center, company for about 2 hours while she was working on her piece. Later in the day he demonstrated the fine art of fish gulping for those participating in Jay’s workshop. 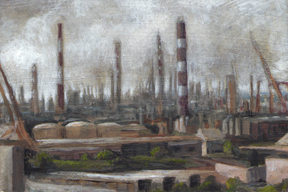 Here are some pics in Plein-air. I think we need to have a few more of these Sunday events in the near future! Check out these links on Jay's page www.jfostermusic.com for a more in-depth explanation of Granular Synthesis. Look under Tutorials! See the EVENTS page for more info. 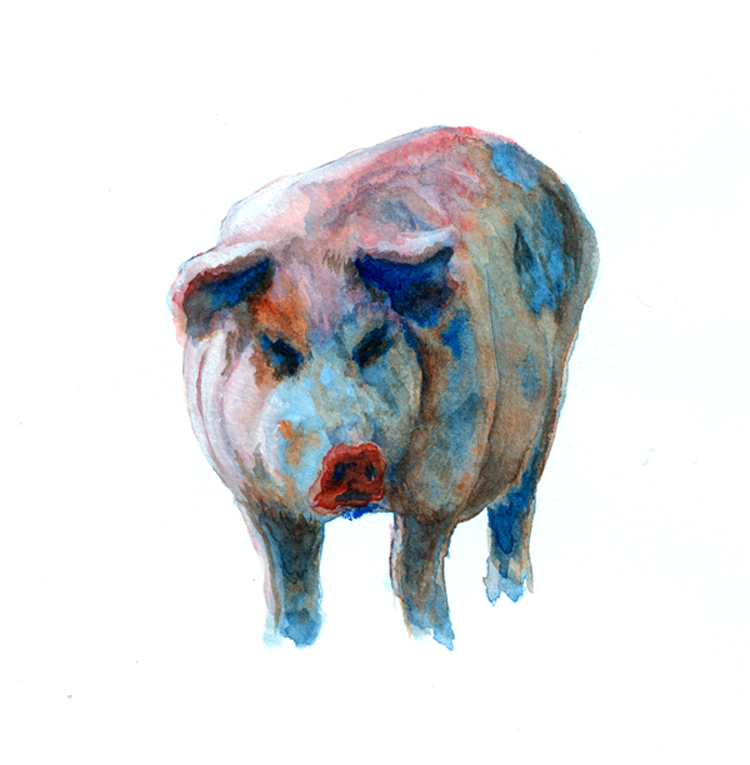 Yesterday I had the privilege of doing some pig drawings out at Percy Thomson Meadows Farm in Bethlehem.They generously let me explore the back forty in Althea where I caught a batch of lovely pigs on paper and some long views.Thank you to the Assard Family! My intention was to start a photo collection of alternative shopping experiences such as the farm stands that operate on a number of local farms,but the pigs were calling:). Currently all sales are made by calling (203)598-9701 or by email at percythomson@sbcglobal.net at anytime. Store hours are Saturday-Sunday 9:00am-1:00pm. Gram'stand at 98 Main Street South in Bethlehem is open seasonally (May-October) when produce is available, usually from 10:00am to 7:00pm. So What’s with all the Vegetables? 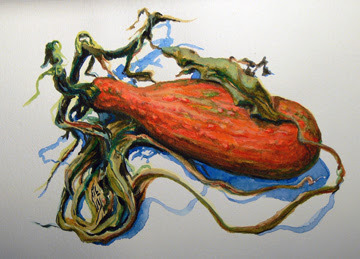 I recently went to an interesting lecture at the Osher Life Long Learning Institute at the University of Connecticut where I will be teaching a watercolor class this week. The lecture I attended was on “Creativity” given by Steven Dahlberg of the International Center for Creativity and Imagination. Paul Gauguin- "Who are we?,Where do we come from?,Where are we going? A semi “synchronistic” event happened upon the initiation of the presentation. I say “semi” because when one is talking about creativity, synchronicity isn’t an unusual occurrence. Each participant was given a quote on a piece of paper to discuss with a stranger. Interestingly the quote I received was from Clark Moustakas. Moustakas is a prominent researcher in the fields of humanistic and clinical psychology. 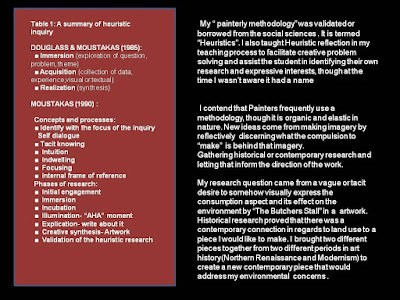 His form of “Heuristics” (a qualitative social research methodology) was a reference source on methodology that I used for my own “practice based art research” in Singapore at the Nanyang Technological University( NTU), where I contended, in a peer reviewed paper, that painting is and has been a legitimate form of rigorous research based on the intuitive and analytic processes of artistic thinking.Creativity also requires a playful attitude. (Just because it is fun doesn’t mean it’s not rigorous or intellectual. Don’t scientists have fun :)? Mr. Dalhberg’s focus was on illuminating that “creativity” is not just for the “artistically” inclined, but a way of thinking that all of us innately engage in at many levels in our day to day lives. I, and many others in the creative industries and art education, agree with this idea. My personal belief is that the practice of drawing or painting can be a way of becoming aware of and accessing this type of thinking.The process of learning how "to see" through developing observational skills and reflecting on the subject is one way of learning how to pay attention and work through preconceived notions. 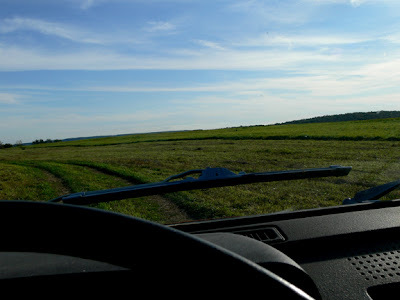 New ideas and conceptual concerns naturally evolve from this place of attention. 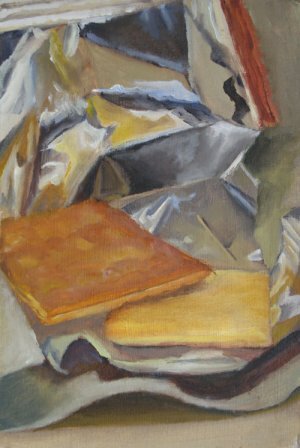 The artist’s direction manifests from reflectively or "reflexively" discerning what the compulsion is behind imagery one is attracted to and the physical experiences that they are engaged in.It is a process I try to infuse in my teaching whether or not the student is interested in pursuing art as a career. Earlier this spring I also had the privilege of being an invited lecturer at OLLI. 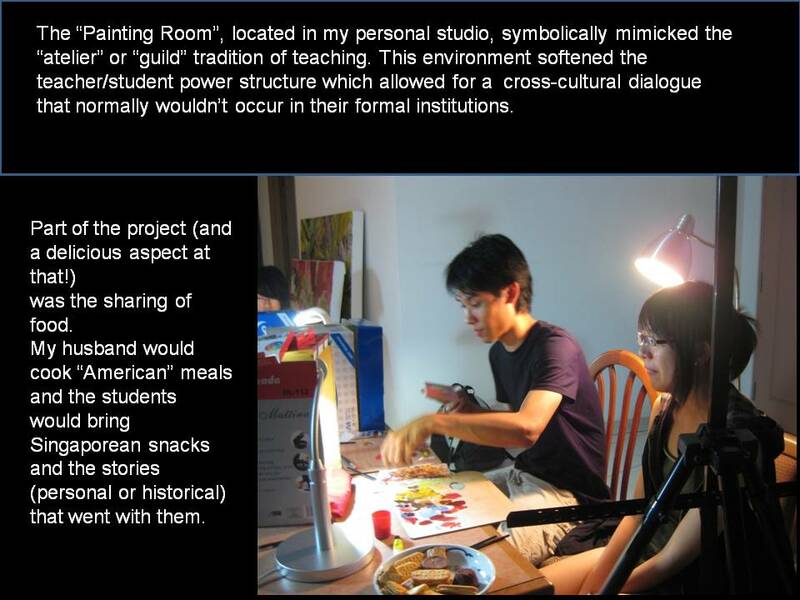 The lecture topic was on my pedagogy and practice-based art research in Singapore at Nanyang Technological University (NTU). 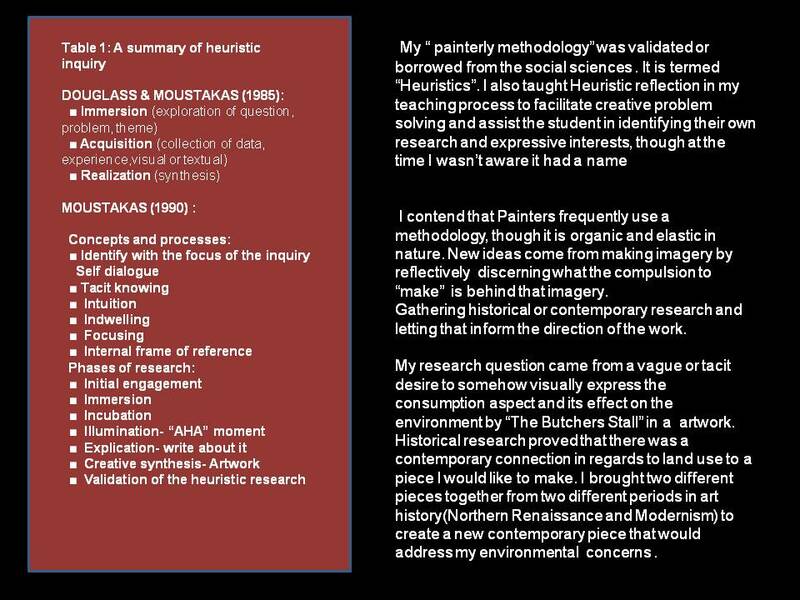 For those of you who are unfamiliar with practice-based art research it can be defined in short, as an art process that produces new knowledge and uses a methodology. This is a working definition of this process which continues to evolve as the literature develops within the field. The qualitative methodologies that are often incorporated in this genre are often sourced from the humanities and the social sciences. 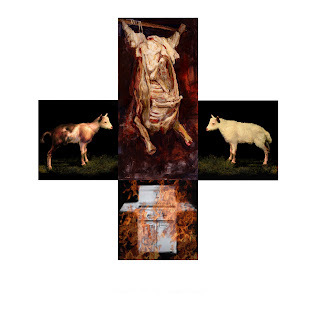 My work, past and present, is primarily engaged with environment in one form or another.The body of work I developed in Singapore incorporated my transplanted experiences of a new culture and urban environment and connected it to my previous work in the landscape and farm animal paintings. 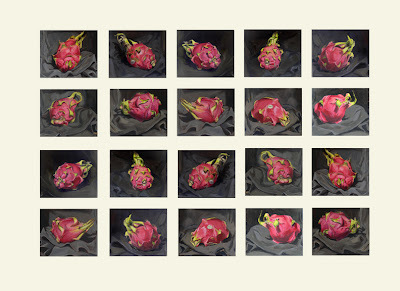 I received a grant from the university to complete the work on my series entitled “Glut” which examined the connections between food, culture, and the environment. 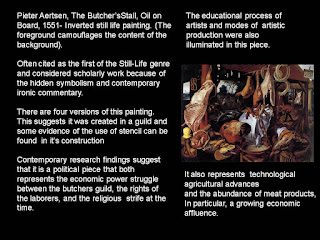 My initial impulse to create the “Glut” series started from a vague or tacit desire to somehow use the inverted still life painting “The Butcher’s Stall” by 16th century Flemish artist Pieter Aertsen, in an artwork that pointed to contemporary environmental concerns in regards to the effects of industrialized agriculture on our fragile ecological systems.I had an interest in this painting for several years in terms of why it was made, how it was made, and how I could bring into play in a contemporary setting. 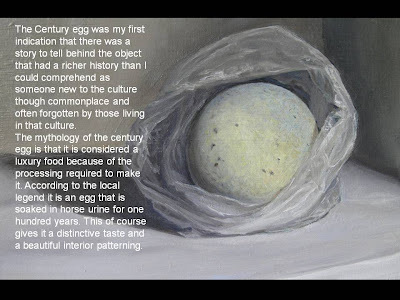 That initial impulse combined with a series of “lived experiences” I encountered in Singapore led to the creation of the painting” Conversation with Pieter and Paul”. 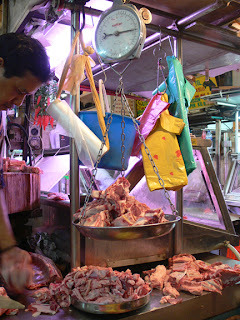 Some of the "lived experiences" that I encountered were the discovery of the Tikka Market.The Tikka Market is an historical wet market and butcher’s stall in the Little India District of Singapore that I came upon quite unexpectedly while exploring my new environment.Something quite different than any previous grocery shopping experience that I had ever encountered!Another such experience was living through the 2006 “Haze”. 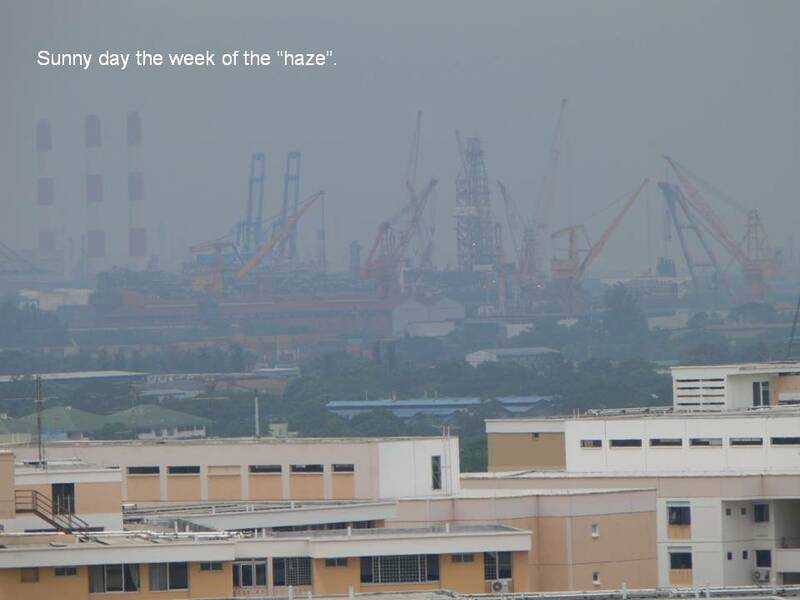 The "Haze" was a period of incredible smog that resulted from the agriculturally directed burning of the the Indonesian rainforest and bog-lands. 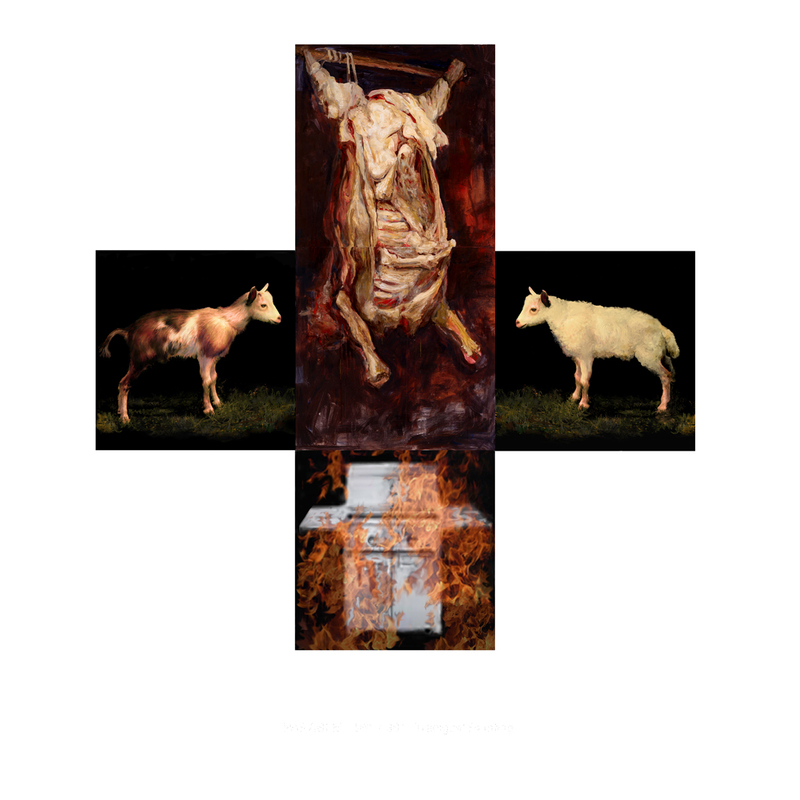 This resulted in a nearly 10 percent increase of carbon emissions into the atmosphere during that period of time when the burning was occurring.The conjunction of those two experiences became the seeding events for the painting "Conversation with Pieter and Paul". 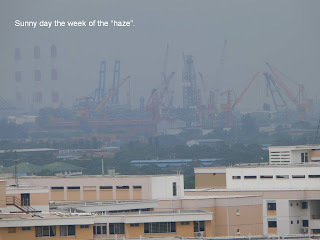 The image to the left, was taken in 2010.The "Haze" of 2006 was even more significant. continuing to inform the piece during its creation. Those series being the "Tree Series" and "Replacement Forest". Concurrently a corollary project developed with some very talented animation students at the School of Art Design and Media (A.D.M.) 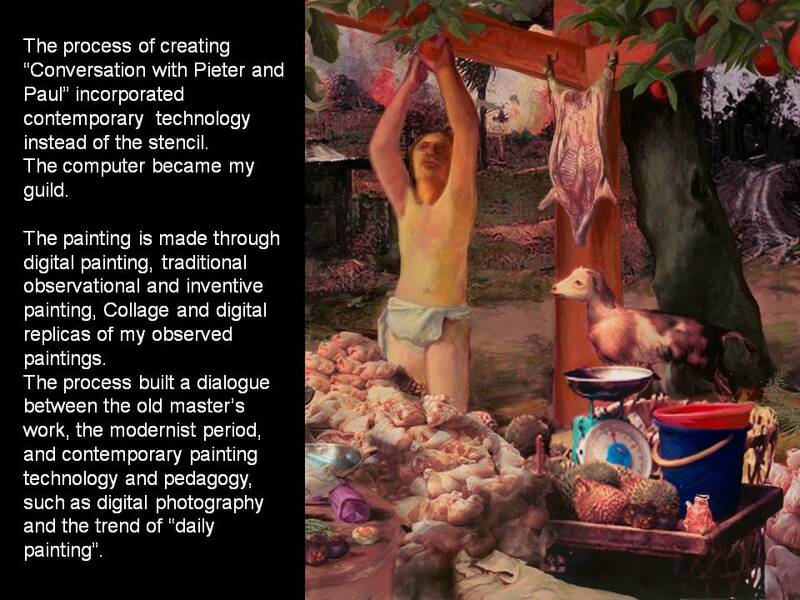 at NTU called “A Visual Feast”. These undergraduate artist/ researchers were some of my former foundation drawing students who were keen to explore traditional observational painting practice in order to more deeply inform their digitally produced works. The “Visual Feast” project’s intention, in short, was to uncover the personal mythologies surrounding the food culture of Singapore, and in particular, the food items that were considered luxury commodities.In the beginning of the project there were lengthy discussion on the environmental aspects of agricultural practices and the environmental impact of the increase in meat in the Asia diet.The student researcher’s initial direction involved gathering historical and contemporary information derived from Singaporean food culture to more authentically inform my work. This is the nature of undergraduate research. 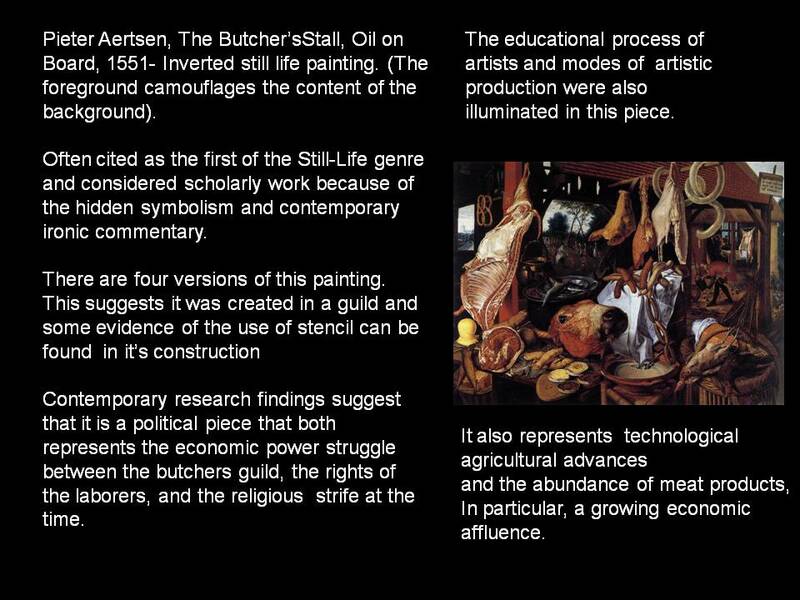 My intention was for the students to find a way to develop their own research questions or narratives through a painter’s approach to qualitative research. A deepening awareness of the ecological impact of culture and food production would hopefully be an outcome of the study. The platform of observational still life painting was utilized and eventually recognized as a form of heuristic methodology. 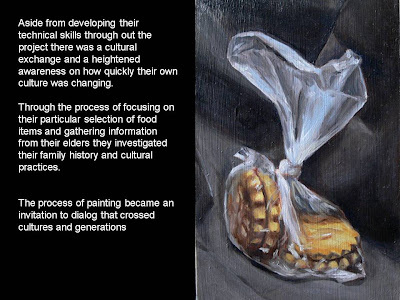 The small paintings of their own selected food subjects became invitations to inter-generational dialogue with their families and a wider audience through a web based platform. Hopefully it became a creative problem solving tool for them to use in their future art explorations. Artist Research participants also included Weityng Ang, She Fong Yap,Antoinette Jade, Mim and Danielle. 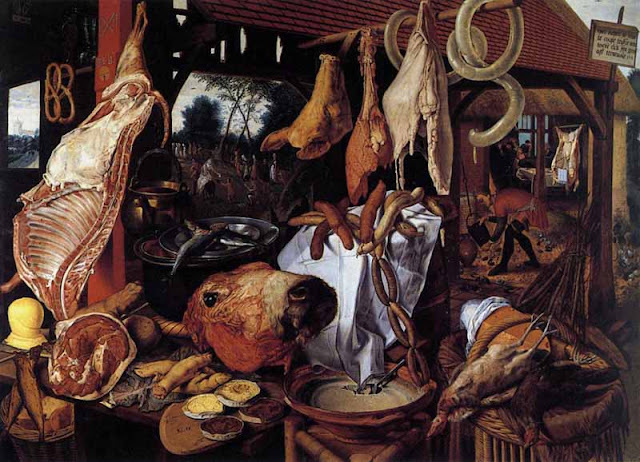 Contemporary and historical food culture background was also contributed by Shicong Huang. Very special thanks to artists Cecily Cheo and Chai Cheo for their input and support! SO WHAT'S WITH THE VEGETABLES? Essentially I am continuing in a community based "research" vein with this Farmers Market project. 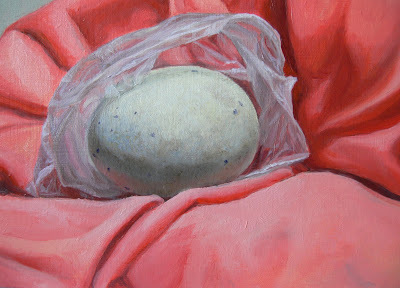 My own still- life, landscape, and animal paintings are studies for a forth-coming version of the "Conversation with Pieter and Paul". 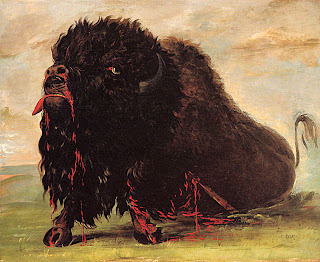 There are two of four planned pieces completed at the time of this writing. These studies are also invitations to dialogue.Through a creative engagement with community in a variety of platforms, such as "side of the road" conversations when out in the field, this blog, and the “Field Projects” exhibitions at Blue Horse Arts.It is my intention to promote awareness of the intertwining of food,culture, and the environment and invite discussion on our own local food culture. This week's vegetable is of the backyard variety.Since we'll again be missing the Farmers market this week, due to the Fall Fest, this lovely specimen was graciously donated by my neighbor Don. It has been a bit of a hectic week with all the preparations for the Fall Fest and a "blistering" return of my sensitivity to solvents. (The Universe is speaking to me).I'm switching back over to watercolor for awhile until things calm down.The timing on this couldn't be better though, as I am teaching a watercolor class at the Osher Life Long Learning Institute at UCONN starting this Friday. 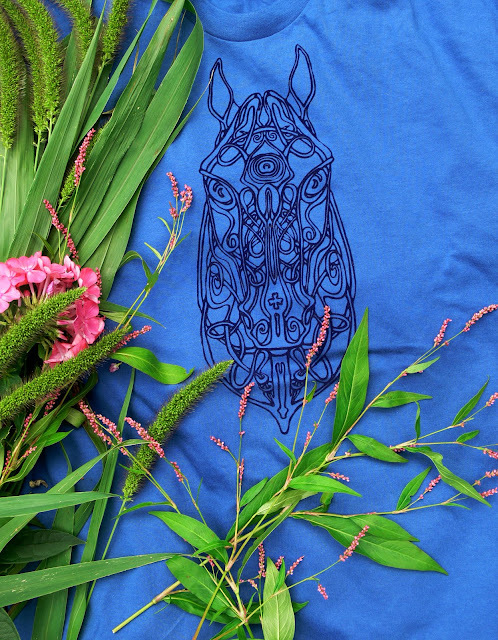 It's also a great excuse to loosen up with some psychedelic pigs. 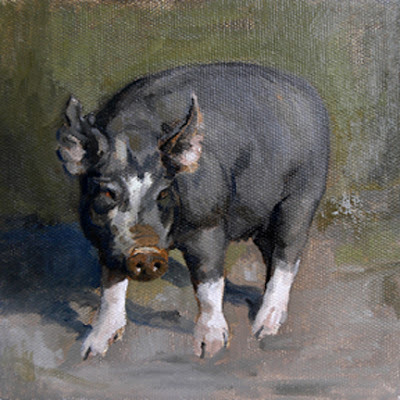 I'll be bringing the pigs and possibly some other livestock to the Saturday event. Partial proceeds will be going to the local food bank. My sojourn to the Bethlehem Fair last week was a wash for giant rabbits. I did however see the world's smallest horse!(hmmm). The highlight of the day came early.While I was admiring some handsome oxen I happened to meet Nebraska farmer Liz Sarno.We had a nice little chat that turned to organic and sustainable farming practices. Ms. Sarno is the Extention Educator and Organic Outreach Coordinator at the University of Nebraska. She had some very enlightening things to say about what is happening in the heartland in regards to organic farming.She also pointed out some interesting persons and organizations that provide useful information in regards to organic agriculture and Farmer's markets. (For further information check the links below). 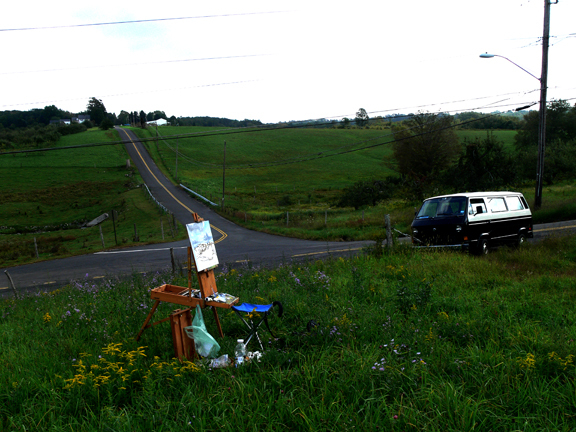 Often while out painting I have "roadside" conversations with people who stop to see what I am doing. (This of course offers me an opportunity to blather on about corporate agricultural practices and the importance of supporting local farming:)). From what I gather during these chats, is that a question still seems to hang in the air "Is organic worth it?". I also find that people may also be unfamiliar with the connection between fossil fuels, agriculture, and the state of the environment. 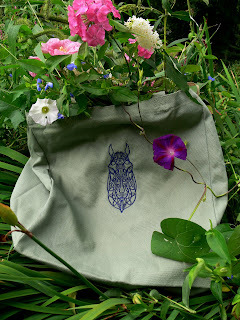 For that I provide the following link:). Alex Alves and Becky Blossom Alves, owners of Shirt Bakery L.L.C. 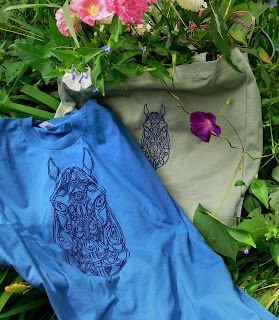 right here in Watertown, have once again wielded their artistry with screen, knife, and thread! This time I'm the lucky recipient of Alex and Becky's meticulous craftsmanship. We've been working with the Shirt Bakery designing a line of Screen Art,T-Shirts, Apparel, and Accessories, which we will be introducing at the forth-coming Fall Fest next weekend. JFosterMusic, Blue Horse Arts, and the Shirt Bakery will be neighbors at the event! 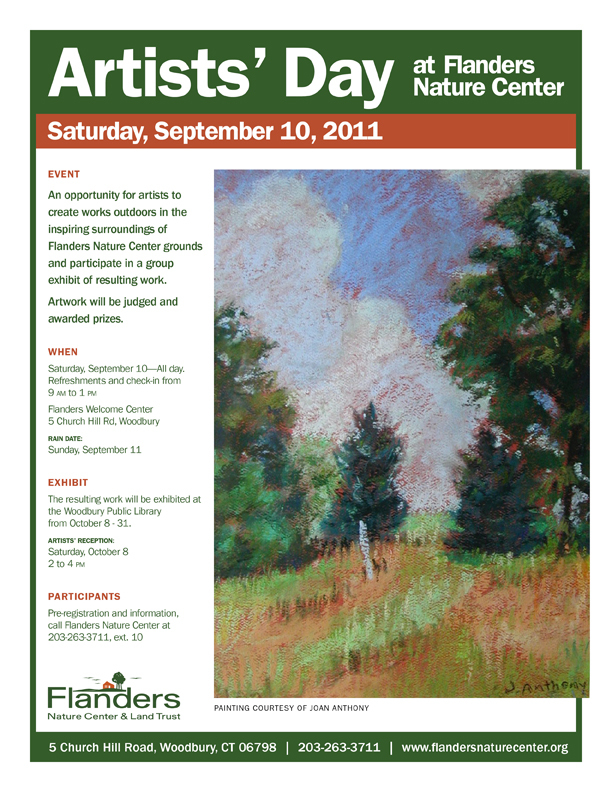 The event will be held at the Veterans Park,Saturday,September 16th, in Watertown CT.
Those of you who couldn't attend the registration yesterday at Flanders Nature Center for the Artist's Day event you can still sign up! Flanders Nature Center is an example of the vision of an artist manifested into reality. 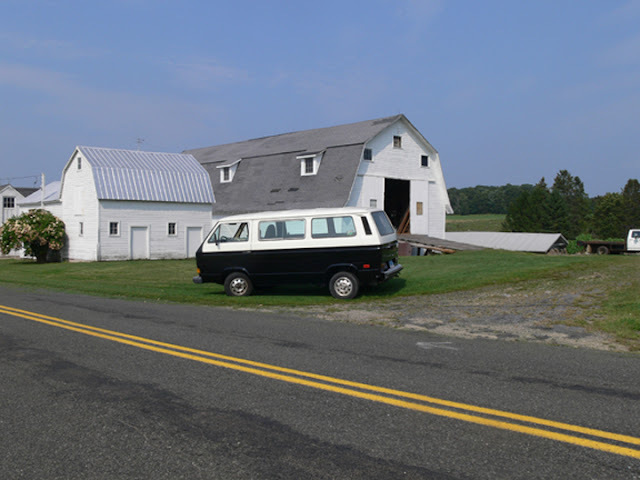 Natalie Van Vleck, painter turned farmer-environmentalist, maintained her studio on this property and derived inspiration from its natural beauty. The center‘s formation was born from her desire to preserve the rural landscape and farming traditions that she drew sustenance from, both physically and aesthetically. In this way Ms. Van Vleck’s legacy is a contribution to an evolving formation of environmental aesthetics. A contribution that is concretized through the creation of the land trust and environmental learning center at Flanders. 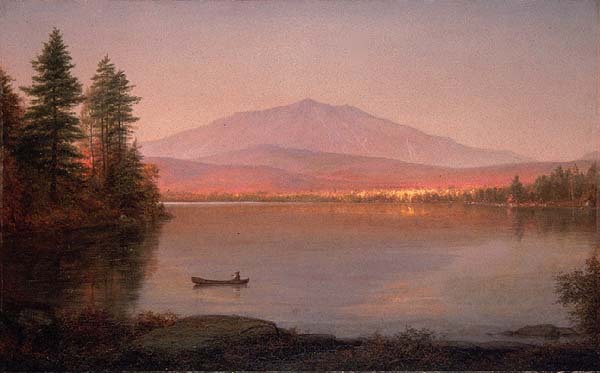 The history of artists shaping the image of nature and affecting a desire toward preservation in our American culture is rooted in the 18th and 19th centuries.Artists such as George Catlin,Thomas Moran, Frederick Church,The Hudson River School and many others,were highly influential in developing an environmental ethic and appreciation in the minds of Americans. George Catlin was the first to propose the idea of preserving the wilderness and native cultures of the American west, and Moran is noted for contributing to the creation of Yellowstone National Park. This tradition continues today and in a variety of visual, musical,literary, critical and participatory formats. In Connecticut we also have an artist’s studio/ residence turned national park. 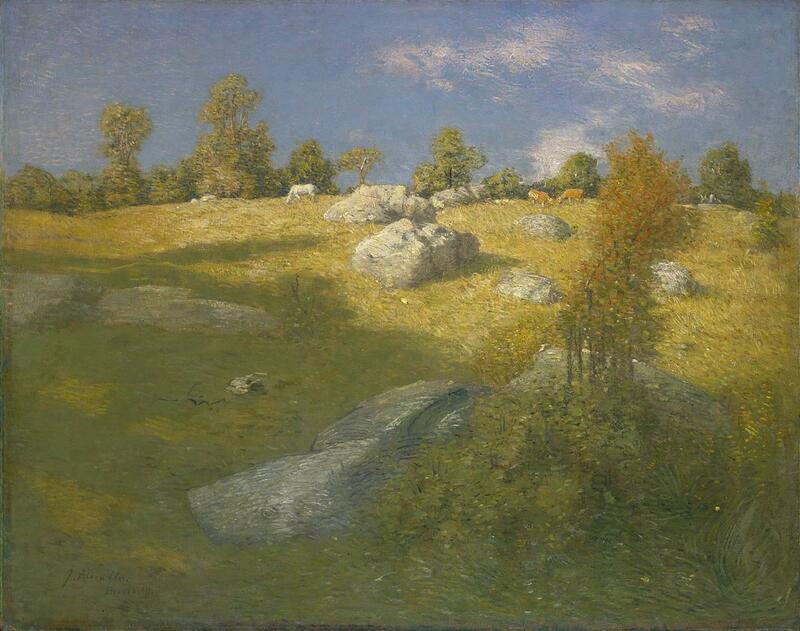 The Weir Farm,studio /residence of J.Alden Weir located in Ridgefield, is one of only two artist's homes designated as national parks in the country. 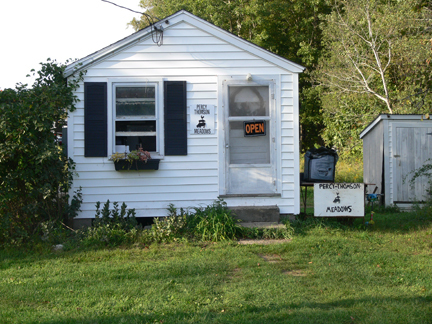 Today the Flanders Nature Center maintains the connection of art and the environment through various programs for adults and children. Besides the studio and Buz Russell Farm museums there is also an active community garden for those interested in pursuing their relationship with nature through organic gardening! So participate:)! Heirloom Tomatoes by computer software technician turned backyard farmer! 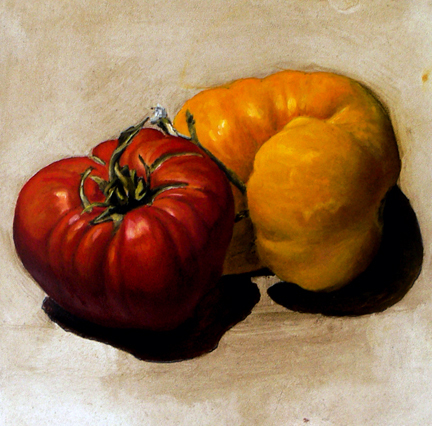 Greg Jewiss had some gorgeous heirloom varieties at the Farmer's Market last week. 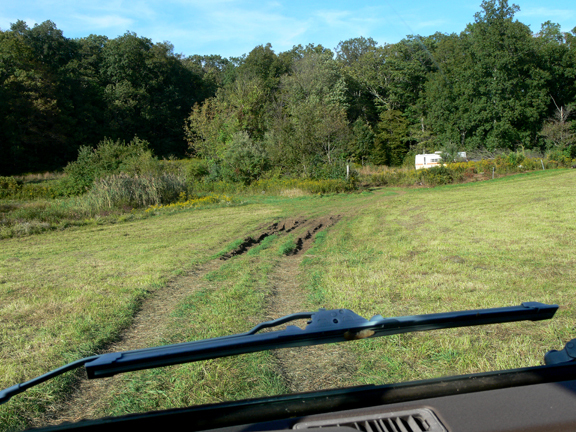 His farm is called Second Wind Farm and is located in Watertown. Greg's foray into farming started with a small vegetable plot in his backyard and grew into a 2 and 1/2 acre venture as it stands now. This is his first year participating at the Farmer's Market and trying his hand at selling his edible wares. So make sure you stop in at his booth and support his contribution to a community food supply! 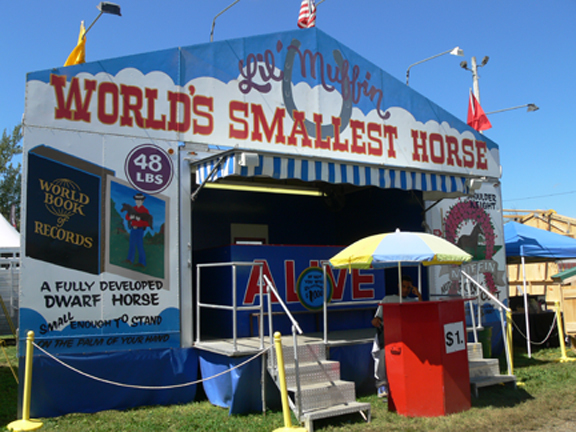 I'll be missing the market this week as I am going to the Bethlehem Fair to see some giant rabbits and the Draft horse competition. 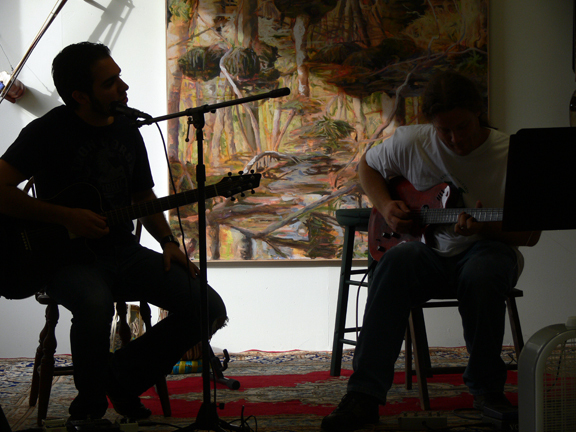 Artists and Musicians are invited to paint and play in the landscape at Blue Horse Arts and Jay Foster Music Studios! Jay Foster will be offering a free demonstration and introductory workshop on using Field Recording and Granular Synthesis to create new soundscapes and ambient compositions. Participants will have the opportunity to observe the use of music technology to record and re-sculpt sounds collected from the wetlands area outside of the studio. 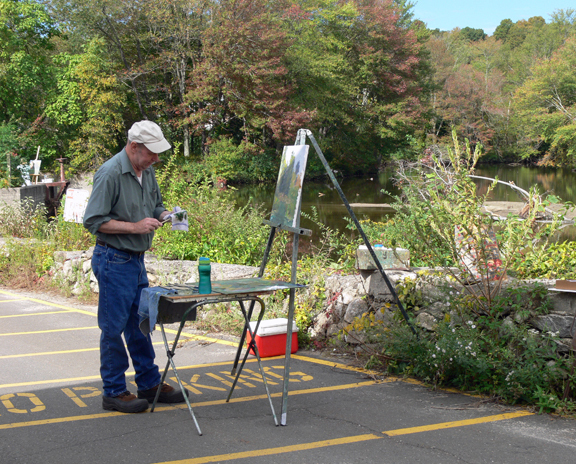 The “Hemingway Pond Paint Out” will be held simultaneously and is open to artists of all abilities. 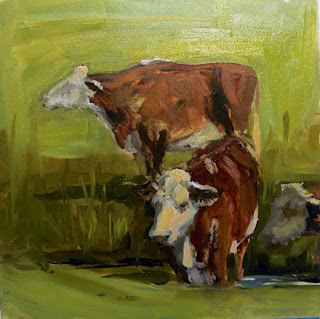 Instructor/Artist Bridget Grady will be on hand to assist those with less experience. Bring your own paints, sketching materials, and cameras and enjoy the natural beauty that lays hidden right in the center of town. Some easels are available on a limited basis, but it is advised that you bring your own. Blue Horse Arts and JFoster Music Studios are located on the edge of Heminway Pond near the center of Watertown, in the old factory space known locally as the MRCO building. Entrance to the studios is on 250 Porter Street. 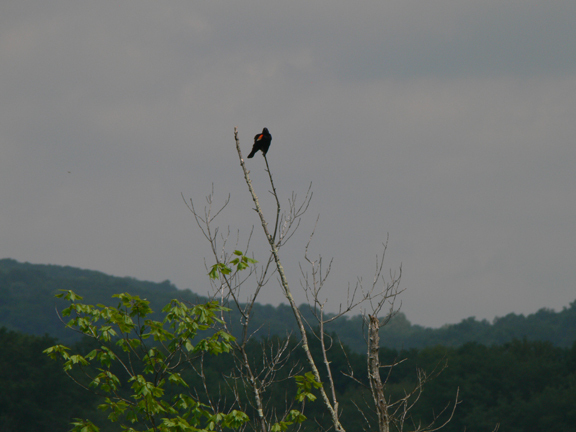 Beautiful views of the wetlands and wildlife are available outside in the fresh air or from inside the studio complex. The events will be held rain or shine. We are fortunate to be able to paint the landscape inside or out and year round from the window views of the studio complex. The “ Heminway Pond Paint Out” and “Music Technology” demonstration is free and open to the public, but registration with the studios is required. 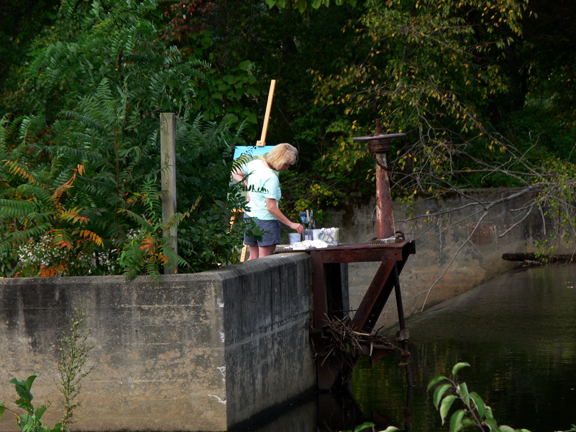 The Heminway Paint Out date is Sunday morning 9AM- Noon, September 25th. The Field Recording and Granular Synthesis demo and workshop will be held also on September 25th 9AM- NOON. Althea posed at Gustafson's Farm in her new outfit. Gustafson's is famous for their apples and for being one of the most beautiful places in town. Yay! Finally! And yes I am obsessed! She is finally presentable on the outside at least, and back to being vegetarian!!!! !Thank you Neil from Maaco!!! And Thank You! Kevin from Alplex for the new VW emblem! 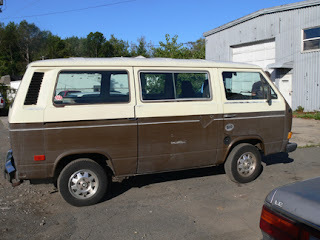 The interior is still ghetto, but this rig is part plein-air studio, work truck and occasional storage unit. (It’s a real SUV not some noxious, pampered Hummer). I’ll need a grant for the interior decorating phase ! A conversion to the even more sustainable fuel, Waste Vegetable Oil(WVO) is in the future! Any philanthropists out there? 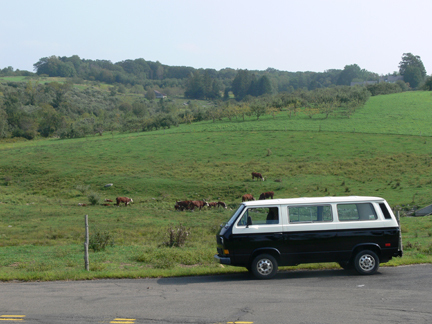 It’s been a long road since I first got my Vanagon diesel in 2004 as an art project/ experiment in alternative fuels. It is an experiment that I couldn’t have done without a lot of hand holding and encouragement from Jim Burke and David Henri. Jim and Dave have been at the forefront of alternative fuels in Connecticut and extremely generous with their time and information. Thank you Jim and Dave! They also were VERY patient! I know NOTHING about mechanical things. Ask anyone who knows me. If I can do this, anybody can, which was the whole point of this venture. Before I moved to Singapore I was driving a VW rabbit that I bought from David Henri who did the conversion on it to run on Waste Vegetable Oil. It ran great on the oil and smelled much better than a regular diesel! A little like Tempura, I got the oil from a Japanese restaurant. Sadly I had to sell it when transitioning to Singapore. (I think she lives in Bethlehem now). After living in Southeast Asia and witnessing the destruction that commercial bio-fuel production does to the rainforest and other fragile eco-systems, I re-adjusted my view on biodiesel as a sustainable energy alternative. In order for biodiesel to be truly sustainable it has to come from waste vegetable oil which mine does. 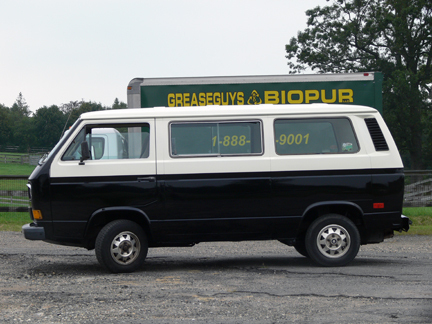 Below is a list of links with information on Biodiesel and Waste Vegetable oil. La Palette The Art of Food!!!!! Right here in Watertown we have an incredible bakery run by artists! 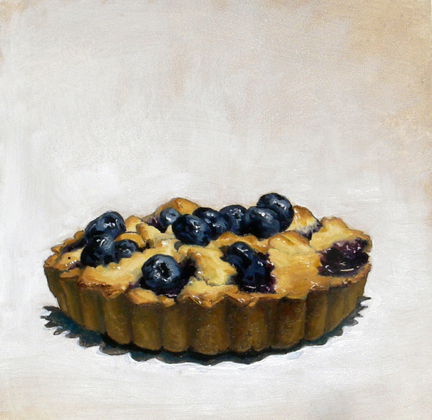 This painting was torture because it took all my will not to eat this scrumptious, blueberry tart!!! I did however buy another in order to be able to truly immerse myself in the exquisite experience of this confection :). 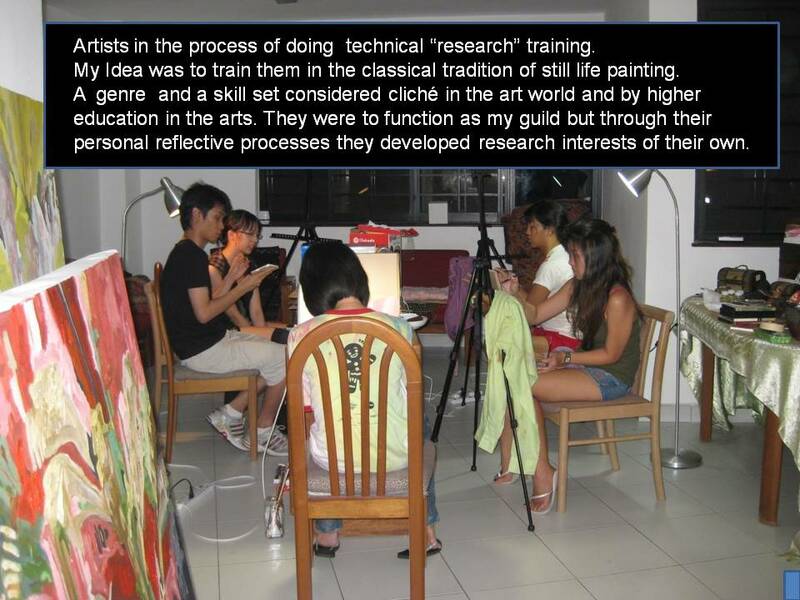 It is my personal belief that this form of participation brings honesty to the painting process, and of course adds integrity to the research aspect of the artwork. Yep, that’s my story and I’m sticking to it! ( I think some further research into those Key Lime tarts might be required in the future:)). 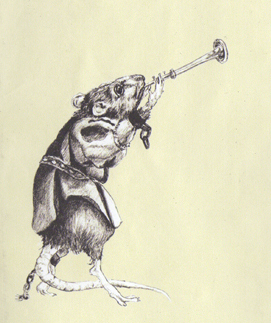 Not only are the Perez’s artisans in the kitchen they are also professional artists, both visually and musically. 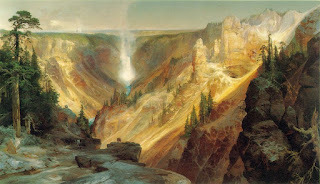 Debra and Oscar Perez are nationally respected fine art restorers and painters and both Carlos and Oscar are musicians. Le Palette brings its tasty wares to the Farmers Market on Saturday's in Watertown. So after you have finished eating your locally grown, organic, vegetables you can pick up a tasty dessert! Strawberry Rhubarb Pie….too die for! Below are some links to articles with more information on La Palette.